Chad Martin had a dream since he was six years old: to be a writer. “I would write about everything from Science Fiction to sports stories,” he responded when asked about the types of stories he preferred. “I could not turn off my imagination.” His first book, “Hale County Book 1: The Asylum” is a reflection of his story telling mindset: always keep the reader wanting more. 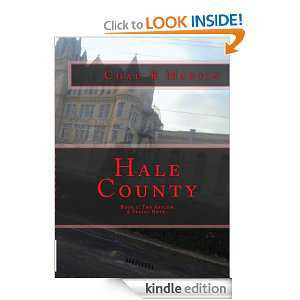 The fictional Hale County, Tennessee is the setting for this modern suspense novel. Mystery surrounds the struggling county. An unmarked grave, along with an old prison that had been turned into a mental institute for the criminally insane, raises the tension in the controversial county where nothing is as it seems. Chad recently formed a company, Laurel Rose Publishing, with his business partner, Dr. Mike Cockrell, to help other would be authors who have always wanted the chance to bring their own stories to life. About the Author: Chad has been in the entertainment field in one form or the other for the past 17 years. The past few years he has spent as an actor in community theatre at the Panola Playhouse. His biggest success has been raising his children. GET YOUR YOUR COPY NOW ! HALE COUNTY DOWNLOAD LINK !